Juliet Jacobson's graphite drawings of blank computer screens very nearly impart the serenity of a Vija Celmins night sky to an ordinary instrument of monotony and overwork, and two finger-thick but otherwise meticulously realistic sculptures of lined paper by Joshua Caleb Weibley, fit together like puzzle pieces from strips of Corian and colored epoxy, find virtuosity in sublimation. 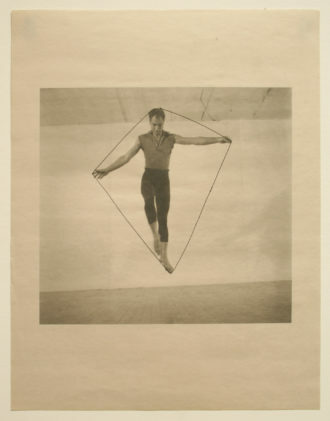 Nancy Brooks Brody’s wonderful “Merce Drawings” — as in Merce Cunningham — are reprinted photos in which she’s made the dancer a kind of levitating tightrope walker by drawing a line around his body, from the soles of his feet to the tips of his fingers to the top of his head. Clintel Steed's“Olympic Series, 300 Relay #1” (2017) an outlandishly impastoed, jagged kaleidoscope of a painting based on a found photo of Olympic swimmers springing off their platforms, suggests a moment of excitement and urgency almost more than it literally depicts it. But in all this art for art’s sake, Jared Buckhiester's glazed stoneware sculpture “Urinal (Full Back)” (2016) stands out for the power with which it leverages its formal idiosyncrasy to emotional ends. Imagine a plucked chicken in football pads with a tube shoved down its throat: At once totally vulnerable and deeply strange, the piece lets you inhabit an unfiltered piece of the artist’s psyche without forgetting for a moment its otherness.